I've got two projects on the go at the moment. Got this guy from 4 Star Minis, a small group of guys crowd sourcing their minis. 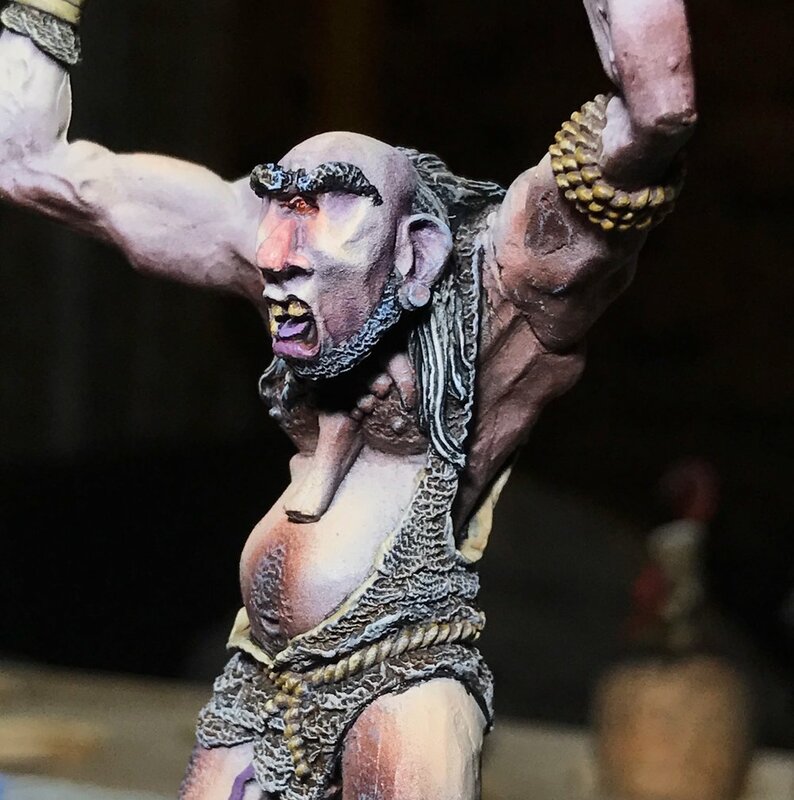 It might take a while to wait for the minis to be made, but totally worth it if this mini is any indication of the quality they're producing over there. You can Find them on Facebook, join their group and get on board with up coming minis if you're interested. Made the base myself for this guy (obviously). I really wanted to push the contrast on my skin tone for Broly, and his hair had to be green just like the show. Gotta clean him up a little, finish the base and I'll call him done. Next up is a little experimentation. I've heard that artists acrylics can be fun to work with so I bought a box of Jo Sonja starter paints. For $30 I got 10 colours, about 2x the amount of paint as in a normal Vallejo paint. I was worried that the pigments would be too course, I need not have. They blend very well, paint very easily and dry a little slower (though that could be the humidity). I'm only about 70% done here, still some smoothing on the light and a few items like his helmet not finished, but it's been fun to paint. The Dark Souls minis are great, though perhaps less depth in the detail than I'm used to it didn't turn out to be a problem. I'm going to post about it, including pictures of my wet pallet and more detail about wet blending and paint consistency. Anyway, that's what's on the bench. I've recently been made aware of a painting competition over at Good Games at Top Ryde, and being a sucker for these things I've shelved my current work to give something a go for it. I've started to paint one of my Giants of Albion, yep sticking with the retro figures. I love this model and have always wanted to paint it. The pictures here are mostly for the face. I'm playing with new colours for faces at the moment, reds and purples on top of skin tones to give him a really gaunt and unhealthy feeling. I've also been working on my eye process, dotting the pupils and colouring the iris to give him more colour and make the eye a little more catching. I'm quite happy with the result on this guy. Finally, looks like I've lost the hands for this model so I'm trying my hand at sculpting a replacement. It's only half way there, layering up small bits of green stuff at a time to get something that resembles a hand. It's really hard to do and very new for me but so far I'm happy with my first effort. Now that Horatio is complete, I'm working on my next project, the Pay Cart. In KoW I'll use this as a battle shrine as it's most appropriate for that role. In 9th Age it works well as either an Arcane Engine or a Battle Altar. It's a fun model, well at least the characters on it are. First up is the Pay Master. I've promised my friend that if he manages to defeat the Demon Price of another mate that smashed my army up then I'll let him name my Pay Master. He hasn't come up with a name yet. Edit: Salvatore Gregorio the Rotund, High Lord Exchequer of the Moot it is. Every other picture I found of this fat little grubby man had him wearing a shirt, but I just didn't see it in the cast so I painted his top half naked. I tried to give the impression of shiny silk wrapped around his ample belly to lather him in opulence, he does of course control the money for my lustful army after all. I used some different shades on his face to give him the red faced look of a man who spends too much time with drink and heavy foods and I'm really happy with the outcome. I wasn't impressed with the cast issues around his eyes or his hands, but I love the rest. His beard, hands, shoes and necklace are not finished yet. Then there's Mydas the Mean. I've posted a few photos of this guy already as i did a non metallic gold photo shoot and tutorial with him. He's done, but still needs weapons, I haven't' decided what to give him yet. Not sure what went wrong with my photo here, it came out rather overexposed. Finally I have the chest. I'd lost the lid so I thought I'd try my hand at green stuffing my own. The lid is made with Fimo, and green stuff for the surroundings. I molded a half cylinder for the base, then etched otu the wood grain finish. It was pretty easy to do. Then just added in green stuff for the metal bindings and rivets. Pretty happy with the result, not a master piece, but then it's just a lid. I'm not good with green stuff so I'm pretty chuffed. Finally, here's a group shot of what's in progress. Not forgetting Mr Ed in the background, he's going to get some attention for this piece too. And that's what On the Bench. Now that the Wolf Knights are all complete it's time to start something new. I was going to do a single model, something high quality, but I'm on a bit of a high from creating a unit so I decided to do another one. Keeping in the Dogs of War theme I decided to break out the Alcatani Fellowship. Had these guys for ages and I will probably rename and theme them once the painting is further through. Keeping with the non metallic metal theme I was going for a polished brass kind of look for these guys. Vallejo English Uniform for the base, Armour Brown for the shadows, Iraqi Sand for the highlight and white for the tips. Sounds like a lot but with loaded brush it is a quick 4 step process. I don't know if I'm all that happy with the blue pants though and I'll probably change that. Pretty happy with the helmet and plume. There are two types of plumes, which is a shame because I like the Mohawk style one pictured here. Going to do about 20 or so for this regiment, count them as dogs of war for KoW and EoS spear men for 9th. A second regiment will let me make a horde in the future, but one at a time. Thats what's on the bench today.